The Rich Razzleberry card base was sponged (around the edges) using Rich Razzleberry Classic Stampin’ Pad, and then layered with two strips of paper from the Share What You Love Specialty Designer Series Paper. I stamped the “good stuff” sentiment (from the Picture Perfect Stamp Set) on one of the laser cut labels from the Share What You Love Embellishment Kit, added a little speckling, and popped it up with a few Stampin’ Dimensionals. Oh… and I also tucked some of the twine (from the Embellishment Kit) underneath the label. Along with strip of 1/4″ Rich Razzleberry Velvet Ribbon, I added a few Artisan Pearls and a self-adhesive silver rose from the Embellishment Kit. Now that’s what I’d call “good stuff”! 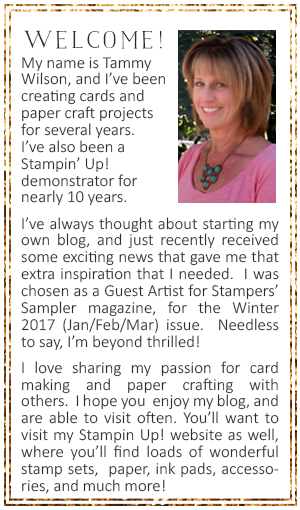 Speaking of “good stuff”…..the brand new 2018-2019 Stampin’ Up Annual Catalog of chockful of “good stuff”! Okay, let’s be honest….it’s “amazing stuff”!